HP EliteBook 2530pI’ve been looking at HP’s EliteBook 2530p. Sadly we don’t have space for a full review but that’s not to say this isn’t an impressive little notebook. 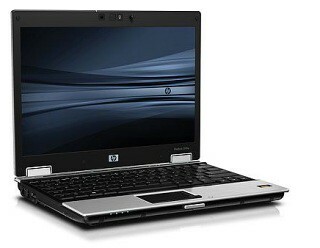 I’ve been looking at HP’s EliteBook 2530p. Sadly we don’t have space for a full review but that’s not to say this isn’t an impressive little notebook. As usual with HP notebooks there are plenty of configurations to choose between. Mine was the FU419ET version which comes in at £1228 ex VAT. The 12.1 inch 1280 x 800 pixel screen is lovely, its matte finish eminently viewable and the resolution offering plenty of viewing area. With just 120GB of hard drive space it might get a bit squeezed in some corumstances, but you can go down to 80GB and up to 160GB by choosing between the configurations on offer. The keyboard is as large as it can possibly be stretching to the full available width, its felt very good under the fingers and there is a point stick as well as a touchpad. The only downside I could find of any moment was that the mouse buttons on the touchpad are a little awkward to hit as they depress into a recess into the wrist rest that also houses the touchpad. HP has managed to get an optical drive into the 282mm x 214mm x 25mm chassis which is pretty impressive going, and the notebook has a starting weight of 1.45kg. This is one eminently portable notebook. The touch strips that characterise HP’s new EliteBook range are here, with a slider for volume control and touch-buttons for mute, Wi-Fi and other features sitting on a thin strip above the keyboard. There’s a touch-button here to disable the touchpad which could prove handy. Models can be configured with mobile broadband to complement the Bluetooth and Wi-Fi. There is a webcam and a light sitting next the webcam lens that can be used to illuminate the screen and keyboard if necessary. Build quality is good with solid protection for the screen and a tough wrist rest among the plus points.